Sinn Féin has said it expects the UK and Irish governments to present a deal this week but that it falls short of what is needed to restore Stormont. Conor Murphy said if a paper was issued that did not meet the "rights and entitlements which are part of the Good Friday Agreement, then it won't fly". 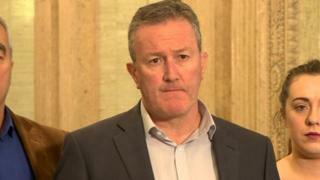 The Newry and Armagh MLA added: "The DUP, I think, have the same position". The Irish government said there was "no such paper". The NIO said it would not be giving "a running commentary". Northern Ireland has been without a functioning devolved government since January. Talks aimed at restoring the Northern Ireland Assembly and executive have been deadlocked over a number of issues, including a proposed Irish language act. Mr Murphy said that if the Northern Ireland Secretary James Brokenshire stepped in to set a budget for Stormont "that's a clear sign that these talks have failed". He said there was no provision for direct rule in the St Andrews Agreement, and the governments would have a responsibility to work on the basis of "co-stewardship". "We want to see a deal, and we want to see these institutions returned on a sustainable basis," Mr Murphy said. Image caption Colum Eastwood said the DUP and Sinn Féin need to 'come clean' with the public. SDLP leader Colum Eastwood called for clarity on the progress of the DUP-Sinn Féin talks. "With just seven days left to find a deal on power sharing, the DUP and Sinn Féin need to come clean with the public," he said. Mr Eastwood said the time for negotiating behind the scenes was over. "After 10 months with no government, it appears that the only thing set to be delivered by the DUP and Sinn Féin is British direct rule," he said. Responding to Sinn Féin claims that the two governments are working on a paper which will set out their "best guess" on how the Stormont talks might be advanced, an Irish government source said "no such paper is in preparation". "Our focus continues to be on supporting and facilitating the formation of an Executive in Northern Ireland". A Northern Ireland Office (NIO) source said the government would not be "providing a running commentary". "We continue to assist the parties in their efforts to reach an agreement," they added.